Figure 1. From left to right: a stellar stream around NGC 5907 (image credit: R Jay Gabany, Blackbird Observatory); multiple shells (and a few streams too!) around NGC 474 (image credit: P.-A. 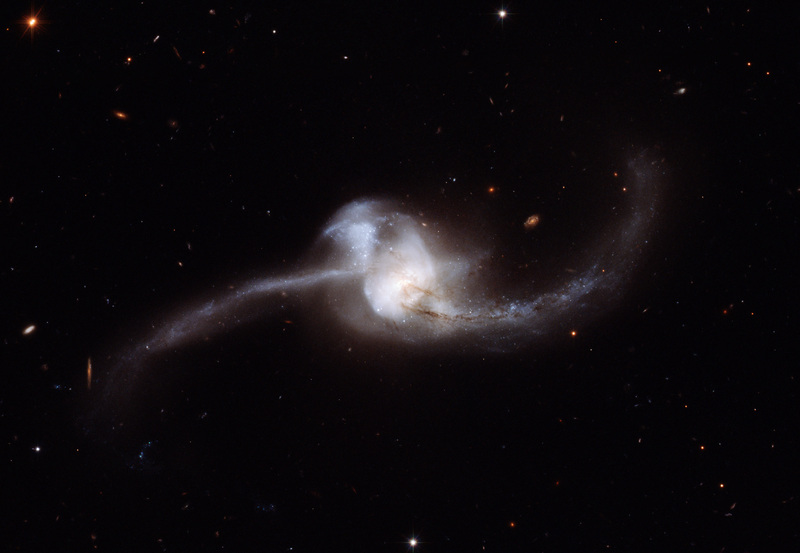 Duc, Atlas 3D Collaboration); the tidal tail of Arp 188, fittingly named the Tadpole Galaxy (image credit: NASA). In addition to providing beautiful material for your desktop background, these tidal interactions can teach us a lot about a whole slew of topics, ranging from star formation history and stellar populations to galaxy evolution and nature of dark matter. So hunting down and understanding these tidal features can be quite an (intellectually) lucrative pursuit! The authors of today’s paper set out to understand how common tidal features are, and which types of galaxies are likely to host them. The sample they studied consists of 1,048 galaxies in the RESOLVE survey (REsolved Spectroscopy Of a Local VolumE), about which we already have a lot of data thanks to other recent surveys including SDSS, 2MASS, GALEX, and ALFALFA. In order to identify tidal features around these galaxies, the authors supplemented the surveys above with deep images from the DECam (Dark Energy Camera) Legacy Survey. They used a masking technique to block out the central areas of the host galaxy and other bright sources in the image, in order to enhance faint tidal features. They then inspected both the unmasked and the masked images (necessary because in a few cases the masking actually blocks out some of the tidal features) to identify which galaxies host prominent tidal features (see figure 2). Overall, they were able to detect tidal features with high confidence around approximately 17% of the galaxies in the survey. Figure 2. 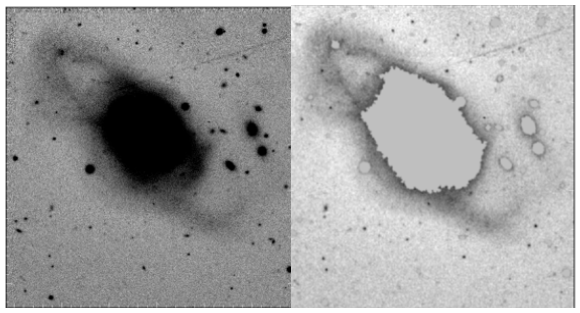 An example of a tidal feature (the prominent darkened ring around the main galaxy) detected with high confidence in both the masked and the unmasked images of the DECam Legacy Survey. Note that while here the tidal feature is clearly visible in both images, in many cases the tidal features were only detected in one of the two images. Figure 25 from the paper’s appendix. The authors considered a wide range of galaxy characteristics in this effort, including specific star formation rates, the ratio between gas and stellar mass, and the morphology of the host galaxy. They also included several characteristics related to the environment of the host galaxy, such as the halo mass, the distance to its nearest neighboring galaxy, and the number of galaxies in its local group. Of these characteristics, the authors found that the factor with the strongest correlation to the existence of tidal features is the ratio of gas to stellar mass. Separating the surveyed galaxies into a gas-rich and a gas-poor group (with the threshold being a gas-to-stellar mass ratio of 1/10), they showed that ~19% of gas-rich galaxies host tidal features, as opposed to only ~13% of their gas-poor counterparts. To further strengthen this conclusion, the authors also trained a machine learning method called a Random Forest algorithm to determine which of the galactic parameters are the most important for predicting tidal features. The results are shown in figure 3, and lead to the same conclusion – namely that the gas-to-stellar mass ratio is the most important factor in terms of the likelihood of hosting tidal features. Figure 3. 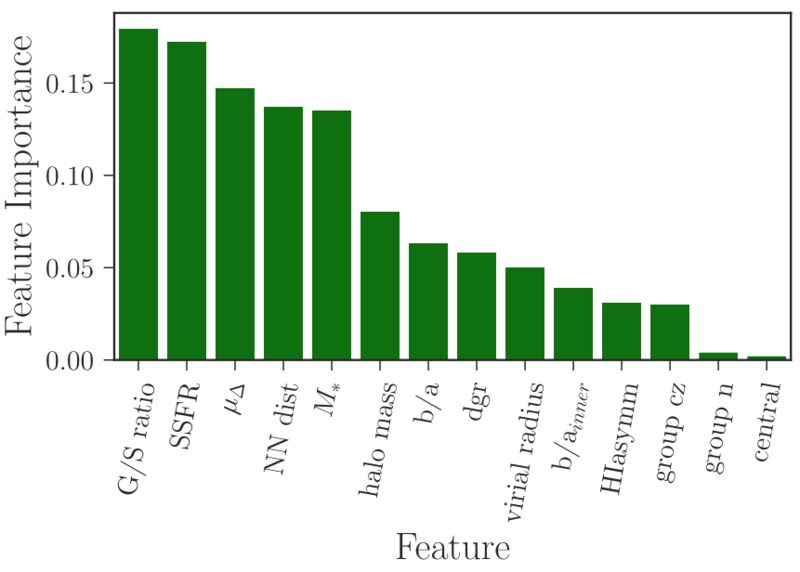 The Random Forest Analysis results for predicting the existence of tidal features, showing the importance (in descending order) of gas-to-stellar-mass ratio, specific star formation rate (SSFR), morphology (μΔ), nearest neighbor distance, stellar mass (M*), halo mass, etc. Figure 6 in the paper. Perhaps an even more surprising result from this analysis is that the actual mass of the galaxy and its halo is relatively unimportant, and seemingly unrelated to the formation of tidal features. One might naively assume that the bigger and more massive the galaxy, the more likely it is to interact with and disrupt many other objects in its vicinity, making it more likely to host tidal features. But this turns out not to be the case; the halo mass comes in a distant sixth place in the Random Forest Analysis shown in figure 6. In fact, when the authors looked only at the gas-rich galaxies in their sample, they found no correlation whatsoever between the existence of tidal features and the halo or the stellar masses of the host galaxy. The authors suggest that these surprising results may mean tidal features arise for very different reasons in gas-poor vs. gas-rich galaxies. They propose that in gas-poor galaxies – where the mass of the galaxy does make a difference – tidal features may typically be streams or shells formed from disrupting nearby satellites. In contrast, tidal features in gas-rich galaxies should not be dependent on the host mass, and are therefore more likely to be tidal arms or tails pulled from the disk of the host galaxy due to an interaction with a nearby galaxy. Understanding where tidal features exist and why they exist in those places is a key to solving many mysteries of galactic physics, and the authors of today’s paper use their results to put forth several hypotheses about the relation between tidal features and the properties of the galaxies that host them. Perhaps equally as impressive, this paper demonstrates the immense potential of combining tidal feature identification with large datasets of galaxy properties from various surveys, in order to draw far-reaching conclusions about the nature of galaxy formation and evolution. This is an exciting time indeed for all of the tidal feature enthusiasts out there!